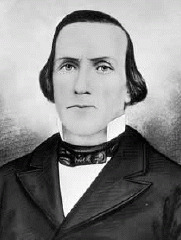 Luke Johnson was a leader in the Latter Day Saint movement and an original member of the Quorum of the Twelve Apostles from 1835 to 1838. He served in the Quorum with his younger brother, Lyman E. Johnson and Orson Hyde, his brother-in-law. Johnson was born November 3, 1807, in Pomfret, Vermont, a son of John Johnson and Elsa Jacobs. He wrote of his family in an autobiographical sketch: My grandfather, Israel Johnson lived in Chesterfield, New Hampshire, and was much respected by his neighbors for his honesty, integrity and industry. My father, John Johnson, was born in Chesterfield, New Hampshire, April 11, 1779. He followed the occupation of farming on a large scale, and was noted for paying his debts and living independently. He moved from Pomfret, Vermont, to Hiram, Portage county, Ohio. He was connected with the Methodist church for about five years previous to receiving the Gospel. My father was satisfied in regard to the truth of "Mormonism" and was baptized by Joseph Smith, Jun., in the winter of 1830-31, and furnished him and his family a home, while he translated a portion of the Bible. Johnson was an educator and a physician.